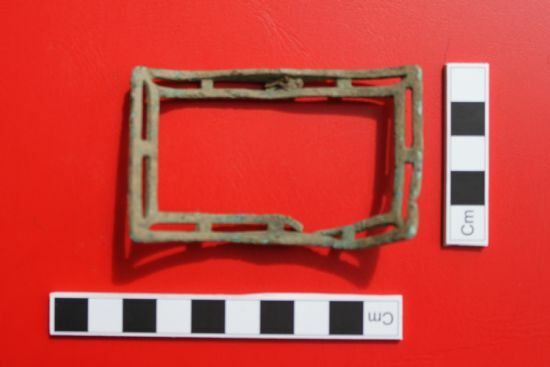 One of the finds from our recent excavation at Foulis was a stray shoe buckle. It was found in the initial metal detector survey by Eric Soane of the Highland Historical Search Society near the mound that our excavation focused on. From its shape and size it would fit an old-fashioned leather shoe fastened by a buckle, a style that would have been in use before the shoe lace became commonplace. It is impossible to date it exactly but could be from the late 1800’s to early 1900’s. The thin and fragility of the metal used to make the buckle and its design might indicate it has been used more for decorative purposes than functional, a small fragment of leather remains trapped in the buckle where it would have been attached to the shoe. The shoe buckle tells us that people were active in the area. Perhaps a traveller from the old coach road running through the estate to Foulis Castle lost a the buckle from his shoe or perhaps one of the Munro’s of Foulis lost it while out walking through the Castle grounds. Whoever it belonged to it gives us an interesting insight into the more recent activity at the Foulis excavation site. Course participants are currently pulling together information on the excavation into a display that will go on show in the new year, see the events calendar on the website for more details.